Entrepreneurship is riddled with stereotypes. This is particularly true of female entrepreneurs. For instance, women starting businesses often attract specialised labels or epithets such as “mumpreneurs”, “fempreneurs” and even “lipstick entrepreneurs”. The mere existence and continued use of feminised descriptions of entrepreneurship fuels the perception that entrepreneurial activity is a largely male preserve. Such stereotyping has an impact. The majority of the women interviewed for this research did not identify with the title “entrepreneur”, often seeing it as a loaded term. Instead, many of the women surveyed preferred terms such as “founder” or “business owner”. For them, they said it was about growing a profitable business and providing stability for their employees. One said, “It isn’t about becoming the next Richard Branson”. This is a serious point about the UK economy. If women started businesses at the same rates as men, there’d be one million more entrepreneurs in the UK. And while the number of women in entrepreneurship is on the increase, this study uncovers that there is clearly more that can be done to remove the unconscious bias – and even blatant sexism – from entrepreneurship: the very sector that generates the highest number of most new jobs, and fosters nearly all of the growth in the UK economy. The aim of this report is to unravel how gender influences entrepreneurship. There will be a particular focus on the perspective and experience of women entrepreneurs. We discuss the entrepreneurial ambitions among men and women, as well as perceptions of gender differences in risk-taking, and attitudes among women in business. Yet this report aims to refrain from sweeping generalisations. This report is not about biology. Instead, we draw from the data and research to discuss the social and historical context in which both male and female entrepreneurs work. We remind the readers that the findings are the result of averages: many will find their own experiences differ. Often, there is more variation within the genders than between them. We also stress that we have focused our research on a highly successful group of C-suite executives and entrepreneurs. They are those who have made it beyond the startup phase of the business lifecycle and are running an established firm. At times, some of the gender differences that have been observed in the general population extinguish or reverse among this group. 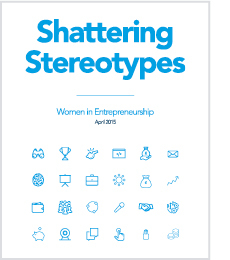 Our hope is that this in-depth, empirical look at gender and entrepreneurship will provide policymakers, investors, the media, entrepreneurs themselves – as well as those considering entrepreneurship – with the evidence to look beyond the stereotypes regarding what makes a successful entrepreneur. Gender intelligence is our aim, and we have developed recommendations for stakeholders regarding embedding such intelligence in their support for entrepreneurs.